Ziyan Sears lived out a defensive lineman’s dream. He found himself alone with the ball and an open field. 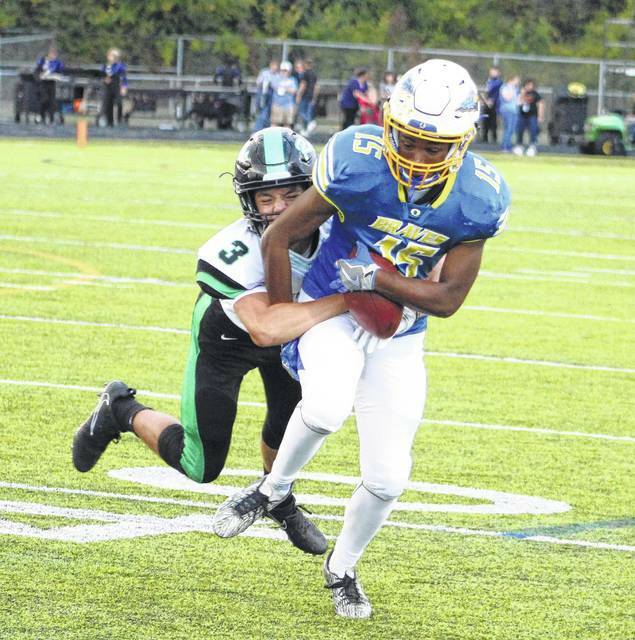 Sears scooped up a loose ball and ran it back 48 yards to give the Olentangy football team the lead for good on its way to a 31-14 non-league victory over Dublin Coffman Friday night in Lewis Center. Coffman quarterback Marcus Ernst lost his grip on the ball, and it squirted backward, where Sears picked it up and returned it for the go-ahead score. Olentangy scored 21 unanswered points in the second half, starting with the scoop-and-score, to hand Coffman its first loss of the season. Riley Bruening tossed an 11-yard touchdown pass to Luke Riedel and added a 2-yard rushing touchdown as Olentangy (3-1) pulled away in the fourth quarter. Olentangy coach Mark Solis made no secret about his displeasure with regards to his team’s performance in a 31-7 loss at Reynoldsburg. Solis said it came down to one thing. “I don’t have a problem getting beat. But, when you’re not physical and you don’t play hard … that just sits really bad with me,” he said. Ernst ran for a touchdown and threw for another as the Shamrocks built a 14-10 lead at the break. He kept it on a read-option and went 11 yards to tie the score 7-7 in the first quarter. He then rolled right and threw back left to his running back Cam Scott, who had a convoy of blockers to lead him 26 yards to give Coffman (3-1) a 14-7 lead in the second quarter. Olentangy responded with a 12-play, 81-yard drive that ended with a Josh Petrone 22-yard field goal to cut the deficit to four with 1:52 left in the half. DeAnte Ables’ first interception wasn’t turned into points, but it did help Olentangy win the field position battle. Petrone pinned Coffman deep on a 33-yard punt to the 6 and, after a three-and-out, Olentangy used five plays to go 32 yards. Bruening found Riedel for 16 yards to set up an 11-yard touchdown pass to Ian Drummond two plays later to give Olentangy a 7-0 lead with 2:27 left in the opening frame. The Rocks had not allowed a single point in their first three games of play. Ables’ second pick led to Bruening’s 2-yard rushing touchdown in the fourth frame. Next, Olentangy finishes up non-league play at Marysville Friday night at 7 p.m.
Olentangy’s DeAnte Ables (15) jumps in front of Dublin Coffman’s Alex Dluzynski (3) for the first of his two interceptions during Friday’s non-league showdown in Lewis Center. The Braves won 31-14.